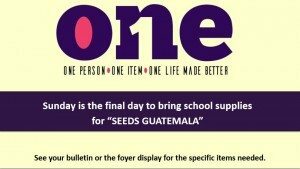 January 31 is the last Sunday for the “Seeds” Guatemala project. You mentioned that angels and demons are variables with influence and free will that affect prayer and other situations. Do they actually have influence or power over people? As I read scripture, yes! Demonic powers, Satan, principalities and powers and rulers and authorities, all that stuff is mentioned in the New Testament. They definitely have influence over people. It’s part of the fallen structure of the world. That’s what temptation is! There’s this lure towards the dark side. That’s one of the ways they influence us. At least, a great deal of the evil in this world is the result of the influence of principalities and powers and demonic forces luring people into destructive and dangerous decisions. Having said that, I want to say that, while I think they have a significant influence in the world, just like we do but even more so. It is also the case that, when it comes to our soul, we can never be, I don’t believe, no matter whatever degree of influence the enemy has (because we make ourselves vulnerable to him), when we are walking with God and sealed by the Holy Spirit and we are walking in dependency on Jesus Christ, there is a protection, at least, in our innermost being, in our hearts. And that’s why the Bible tells us to guard our heart. It wouldn’t tell us that, if it wasn’t possible to guard our heart. So I don’t think that a person can be made evil without their wanting to be made evil or, at least, in incremental stages to go down that path. However, I do think that scripture really shows that there can be influences in other areas of our life. Just as with our own free will as human beings, we can harm innocent people with our decisions, so, also, in a war zone, innocent people take hits from spiritual forces. I’ll touch on that a little next week. So the answer would be, yes, they can influence those things. It seems that Jesus answered and healed every need he met in his ministry, yet it doesn’t seem to happen that way in our everyday life. What is the difference? Well, He’s the Son of God – we’re not! He had a little advantage there! This goes back to the C.S. Lewis quote I referenced in Unanswered Prayer Question 1. He said that what bothers me is not unanswered prayer but the holding on to the expectation and the promises. It wouldn’t bother me at all if Jesus could just do all the miracles, and that He was the miracle worker and we’re not. I could deal with that. The trouble is that he was the miracle worker, and then He said in John 14:12, “Greater things than these shall you do.” That’s where the problem lies – right? And we’ve got to be okay saying, yeah, that’s a problem, that bugs me, I just don’t have an answer for that. I can give you some variables and some other things; but, in the end, I can’t answer the question. I have enough reasons, however, for believing that Jesus is the Son of God. He’s the revelation of God. He reveals the deepest truth about who God is, about who I am and about who you are. I can give you all my reasons for believing that no matter how aggravated I am by the miracle‐working power that we’re supposed to have, and, although, it doesn’t show up as much as I would think it should, it doesn’t trump all the reasons for my believing He’s the Son of God. And so, I’ll keep on believing, and I’ll keep on obeying, which means I’m going to keep on praying. I’m going to keep on pushing forward. And then, we do our best to try to understand questions like this. So, in this case, it does help that Jesus, as a perfect, sinless human being, had a relationship with God that we’re to aspire towards; but I don’t think any of us are there. And, I suspect, that one of the reasons why Jesus batted almost 100%. But part of it was that he’s listening to God, and God knows all the variables, so he only prays for those for whom it would be effective to pray for. That would be the kind of consideration you’d look at, and there are other things, as well. In the end, it’s a very, very tough question. You’ve just got to keep plowing forward. We have come up with many excuses why God is not capable of answering prayers. Do we just need to lower our expectations for this life? We wouldn’t have these expectations if it weren’t for all these promises. And I can relate to that. It’s the disappointments. I would rather be surprised than disappointed, so I would always want to lower the bar. I don’t like to be let down. The trouble is, however, that I regard the Bible as being inspired and authoritative, and the Bible is what gives us these promises that prayer is powerful and effective. Two, on the other hand, we see that often prayer is not answered, and so we try to do our best in terms of thinking why isn’t it answered, given the variables we talked about, and living in the mystery of this war zone and things coming off the way they do and being real with that. And at the same time, holding onto faith and saying, I’m going to keep on trusting that prayer is powerful and effective, even if I can’t see how it is always answered. It helps me a lot to remember that faith is not psychological certainty, so that I don’t need to be trying to constantly convince myself that something is going to happen when I know that it might not. I burned out on that rather quickly. Just know, it’s okay to say I don’t know if this is going to turn out, but I do know that this prayer here and now is going to make a difference. It’s influential, not coercive. Partnering with God will bring about God’s will on earth as it is in heaven. How do we stay motivated to become better if your significance is already set? I think the question itself reveals how thoroughly and how deeply ingrained the Lie of Acquired Significance is to us. If all your life has been lived to try to acquire significance, it is probably initially hard for you to even imagine being motivated by any other thing. It could be the case that the reason you’ve done anything; is to acquire something, or to impress somebody, to try to fill your life, or to fulfill a need of some sort. So your whole paradigm of living, and this is true of many people, maybe all of us, to some degree, we’re motivated by this emptiness to live what Paul calls “in the flesh” or to live in this fallen world. At the core of changing that is the exercise I mentioned on Sunday – using the insert available here. To live out of fullness, you have to be experiencing fullness. You have to have some times set aside, you have to gas up and start changing, be transformed by the renewing of your mind, to take in the truth and let it start to confront the lie and overcome the lie. And it’s not going to be instantaneous. The Holy Spirit is involved in this, and so has divine power to it – but God doesn’t do Neanderthal. He rarely does Neanderthal in us. He works within us to empower us to take captive every thought to Jesus Christ, and there’s a role we play in that. So we have to choose to believe the truth and confront the lie and choose to meditate on the truth and to grasp the truth and to see Jesus and to hear Jesus and sense Jesus speaking to us the truth. And, as we become convinced that our worth and significance is given to us by grace, upfront for free, apart from our works, then we will find that our motivation starts to change. In fact, I suggest that the person who has learned living out of fullness will do more with their life, in terms of objective measurements, in terms of the splash they make; they’ll be more motivated when you have learned who you really are in Christ. Now, you live just to express that rather than trying to achieve something you think you’re not. This is not about sitting on your behind and just eating potato chips because God loves you the way you are. He just loves you as you are; but, if you get that, you’re not going to be just eating potato chips and sitting on your behinds. No! It’s like, “I get to dance with God.” And this is what dancing with God looks like: I want to be the best husband I can be; I want to be the best player I can be, if that’s your calling; or the best teacher I can be; or student I can be; plumber I can be; or dentist I can be, whatever the calling is. Now, you want to dance with that because you know inside who you really are. But aren’t we to be rewarded in heaven based on how we steward talent on earth? It seems that some have more significance than others. A great question. This really is an important idea, and it is hard to pack to pull together a short answer, but let me try. There is a difference between an intrinsic reward and an extrinsic reward, or an intrinsic punishment and an extrinsic punishment. An intrinsic reward or punishment is connected to what you did to get there. An extrinsic punishment or an external one is not related to the activity. In a judicial system, if for example, you are in a court of law and convicted of stealing, your going to a prison is connected to the fact that you stole. But, if for example, you’ve been smoking for 25 years and then you develop emphysema; that, in a way, is sort of a punishment for that behavior, but there’s a naturalness to it. The sin brings about its own consequences. Certain behaviors bring about their own consequences that are either rewards for one kind of behavior or punishments for another kind of behavior. The main paradigm from the Bible about rewards and punishments is this: The rewards are the natural outworking of living in a certain way and punishments are a natural outworking of living in a certain way. And, when you find, in the Bible, Jesus saying, “Go this direction and great will your reward be,” this is what it’s talking about. The life that you acquire is the reward you get from going down this path. And one kind of path is the one God created us to go, and there is fullness of life, there’s joy, and there’s a tremendous reward there. When we go the path of self‐worship, call our own thing and go our own life, that’s not the way we’re created to live, so we’re living against nature. We’re beautiful, Drachma coins, but we’re wallowing in pig manure, and that brings about its own consequences, as well. And the trouble is, we, in the west, as I’ve said many times, tend to think of things in a judicial paradigm. So we think of rewards and punishments as extrinsic, that it’s something a judge sentences us with; but, in the Bible, it’s much more organic. It’s much more holistic. Living in a certain way brings a reward and a punishment, but the rewards and the punishments are connected to how we’re living to get there. Let me encourage you to read and re-read these statements, check out the Scripture references, think on these phrases. You may want to take 1 or 2 a day and remind yourself of these truths as you go through your day. Additional copies are available at OCC, on our facebook page, or here. We are part way through the Gospel of Matthew as we read through the Gospels this year. If you haven’t started yet, it’s not too late, or if you have fallen a few day behind. If it seems overwhelming just pick up where we are & then as you get into the habit you can go back and catch up. A copy of the reading list is available at OCC, or you can get it on our facebook page or you can get it here. 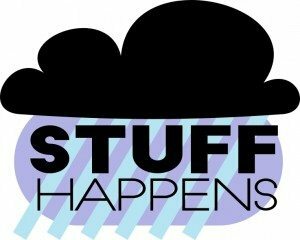 We are starting a new series this Sunday: Stuff Happens. In this world, there is a lot of suffering. As Christians, we sometimes ask “Is God even in control?” In this Sunday’s message, Mike addresses how we react to suffering and also how God is in control of the situation. He ends with some practical guidance on how to follow God in the midst of suffering. If you wrestle with any of these areas, or have questions, we will try to address some of them on Sunday or on this site. So if you have a question send it to: questions.